and then I come home, he’ll start making dinner while I take Livi upstairs to give her a bath, feed her and put her to bed. If I’m making dinner, he watches Livi, or she’ll sit in the bouncy seat and hang out with us while we cook together. 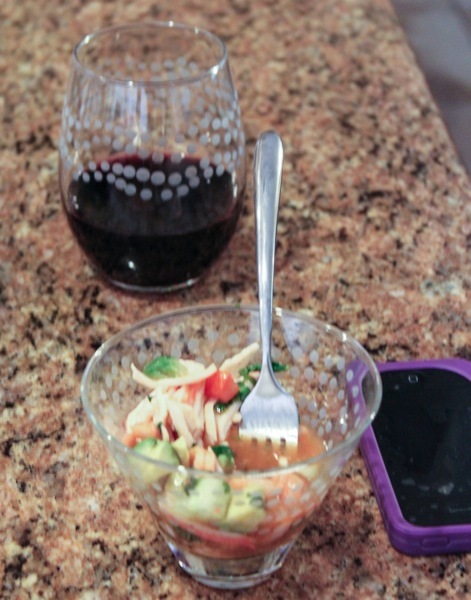 and the Pilot served us some wine and ceviche while we he prepped dinner. I’ve been hankering for grilled corn on the cob lately, so the Pilot made corn, steak for himself, mushrooms (for my “meat”) and a giant, grilled sweet onion. 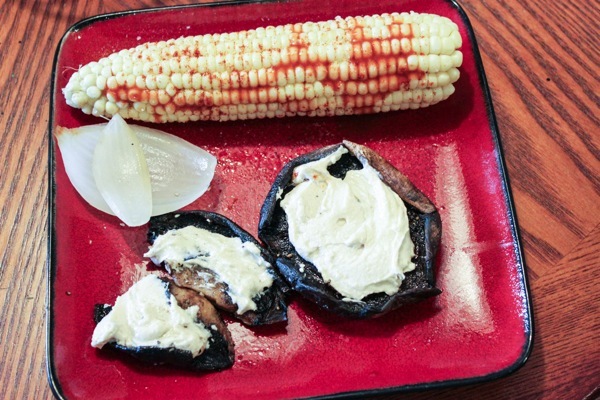 I had a couple slices of the onion to try it, enjoyed some tahini sauce on my mushrooms, and LOVED the corn. It’s funny because I used to hate corn, and now, off the grill in the summer, I love it. After dinner, I went to the gym to take the video and pics for this week’s Summer Shape Up workout. I hope you love it! The entire workout will be up tonight on the Intro Page, where the Week 3 grocery list and meal plans are also located. Who’s grocery shopping and planning for the week? What’s on the menu? Hope you have a very happy and restful Sunday! Last chance to enter the healthy snacks giveaway! 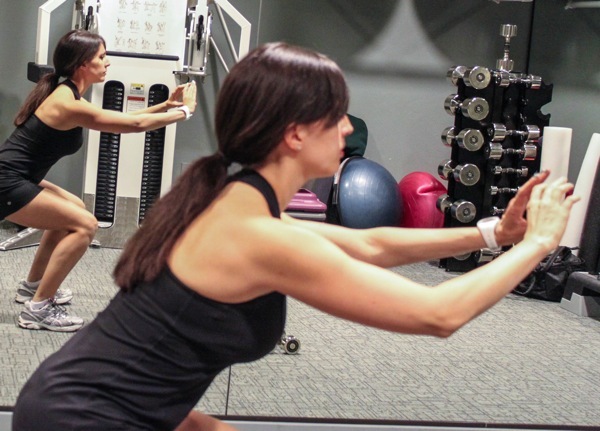 You do a great job of filming and taking the pics for your workouts! 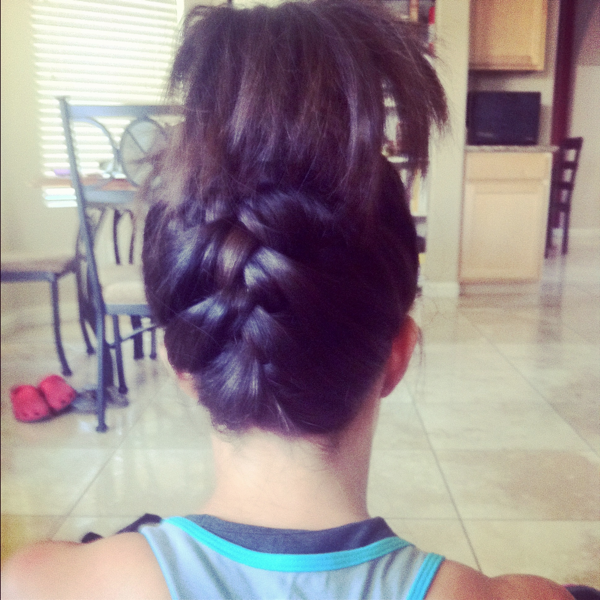 OMG, I love this hairstyle. I was actually trying it out yesterday!!! Looks awesome. Do you have any advice on how I can re-create it so that it looks like yours?! hahah.. oh god, i fixed it. Glad, I could help out. Groceries are bought and prepped for the week. Nice to have that out of the way! Loving the Dr. Seuss hair! I bet it brought a smile to everyones face before your class! Love your Dr. Seuss hair and the idea of thai sweet chili pop chips! I’ll have to keep my eyes peeled for them! Btw, my calves were KILLING me all day yesterday & somewhat today from Friday’s workout. Must have done something right :p Have a great Sunday! Such a cute picture of bell! Love the puppy eyes!! My legs were about to fall off after doing tabata yesterday. So much fun though! I’ve only had Popchips once…a little sample bag and that flavor sounds worth checking out. 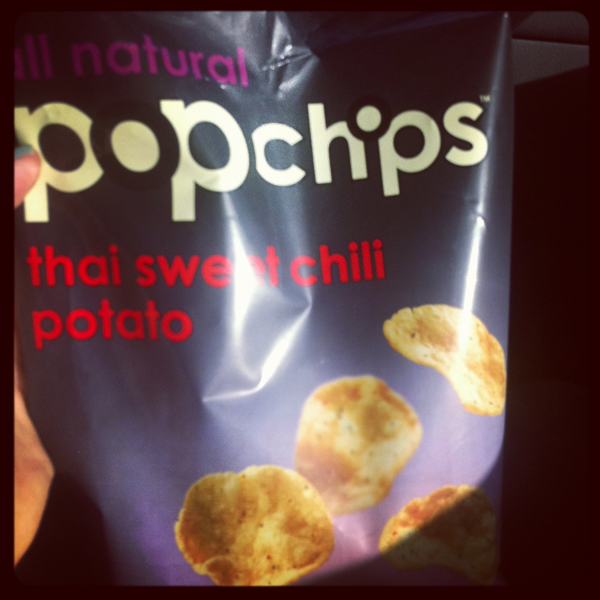 I have crohn’s so no popcorn for this girl but pop chips are a good replacement and there so yummy! Love the hair it’s so different! Love the hair, Gina. I like alternative styles! that is so awesome that you two make such a good team. that is what i’m hoping for when we have a baby come along! I love seeing pictures of Bella. 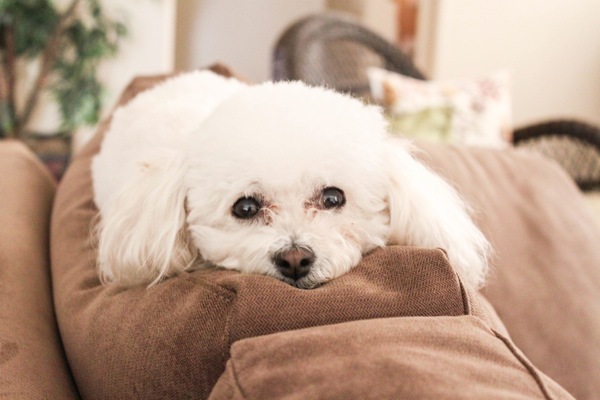 I had a dog that looked just like her, but she passed away earlier this week. 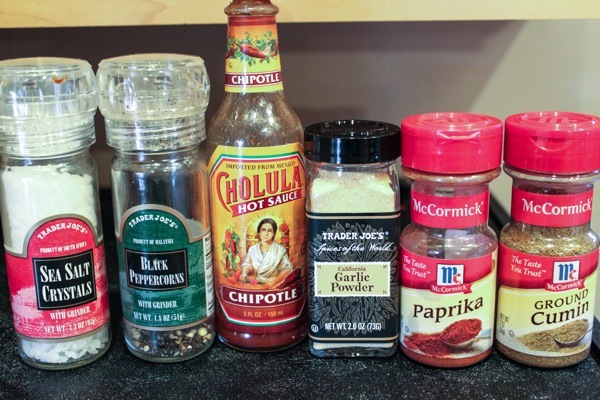 🙁 I’m going to try adding some spices to my corn on the cob. I am usually just a sea salt and Earth Balance girl when it comes to my corn. How do you get the French braid so tight?? Every time I try this it’s a disaster! Bella looks super adorable in that picture! Her eyes are the best! I have plans to try out your workout tomorrow, can’t wait! awwww, The Pilot sounds like such a great husband:) that corn does sound delicious! and i love the pic of your pup! sooooo stinkin’ cute! That last picture of Bella is adorable!! And your hair looks so cute like that! And of course you must have a glass of wine if a handsome man pours it for you. It’s the law! Have a great Sunday, Gina! Gina Lou Who? Very cute. Oh the hair! I have tried that so many times! The plait always comes out okay but then something wierd happens at the front with my hair going all poofy like a helmet. Nicely done! Made coconut shrimp and rainbow chard rolls with cauliflower rice. Made the shrimp with coconut milk. It was very yummy! No leftoever here!! Heading to grocery shop! 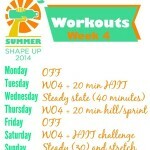 The Workout this week looks great Gina!! I can’t wait to try it! Glad you liked the Dr. Seuss comment 😀 I can totally see you dressing up with Livi one day in matching costumes! 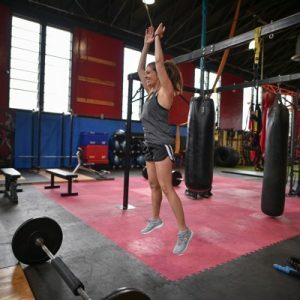 I’ve been looking for a great fitness blog that’s a bit more personalized and cute. This is it!! I’m looking forward to reading more. I’ve been on this great workout routine as well as changing my eating habits. Started on Herbalife and it’s been great thus far. That looks like an amazing meal that I’ll have to replicate! I love that picture of Bell!